if you are interested in any items from the collection, or if you wish to view the full collection at our showrooms please do not hesitate to contact us. The AW2013 Collection is due with us 28th January 2013 for viewings, Images and catalogue will be online by Mid/End February. 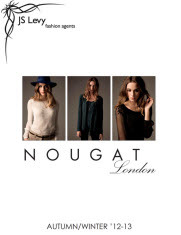 Nougat is new to JS Levy please take a look at the AW2012 Collection to see why we are so excited about this collection.